I thought reliability and longevity were maybe the most important.. Desire for reliability & longevity are a given, no? Otherwise the criteria under discussion really wouldn't matter. I'm referring to personal experience. Raising static compression (using established measurement criteria) improved power/response in off-boost performance. Also improved dramatically the performance of my NA Fiat Cam timing & lift are other variables, obviously. Static compression limits your dynamic compression under boost. There's a limit to how much you can raise the pressure in the combustion chamber before detonation happens regardless of timing. See diesel engine for more information. I love my n/a Toyota with 11.5-1 from the factory but it won't take more than about 7psi (anecdotally, mine is not boosted) before bad juju happens. People who boost the 2zz-ge, monkey wrench racing specifically, lower compression to 8.5-1 and use Carrillo rods to replace the factory H beams. They have a 400hp 1.8l Celica that does 202mph but it's doesn't have 11.5-1 compression ratio I guarantee it. Fiat head like this one? That combustion chamber? Yes i see now..It's exactly the same shape and configuration as a B230 8v head..same plug location, same 96mm bore...or real close..72mm.. But I see how the direct, personal experience is transferable to this discussion.. I can see how burning all the way across 36mm from plug to cylinder would take the exact same time as burning across 96mm with the plug over on one side. Diameter and plug being completely irrelevant to the time for flame front to propogate over a distance. Terrible..Barely drivable off boost, it almost looks like the car is going backwards. By the way have you done any calcs for dynamic compression with 1 or even better 2 bar boost? That black thing sitting over <-------- there has 8:1 static, is mapped for 2 bar boost and peak torque is somewhere around 3200.....and whn that thing with those cams (very mild cams, like 199 dur @ 050) the dynamic compression is like 21.65:1...really..
Are we conflating the effect of intake pressure with dynamic compression ratio? No one was talking about cams. Not aimed at you John, just the discussion in the last two pages. Lando you have an enticing midriff. 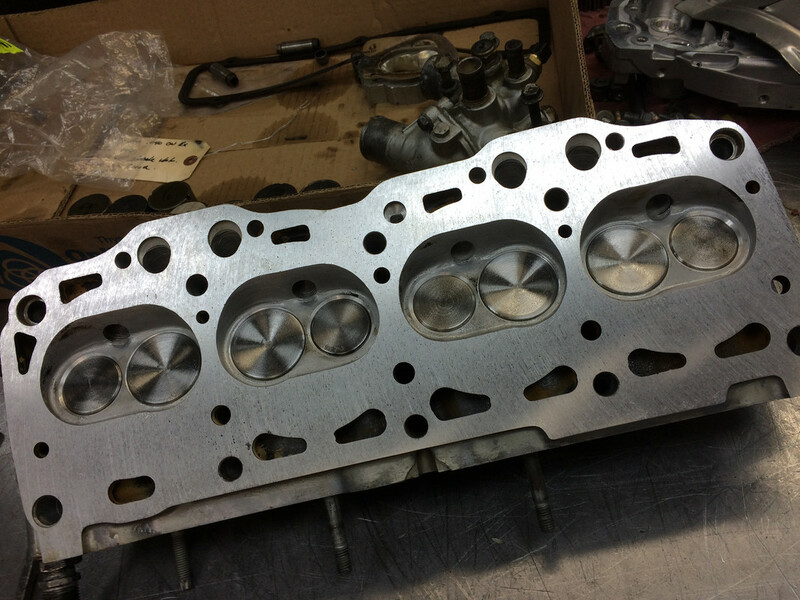 No, I'm talking about 70's OHC 8v technology - my X1/9 is cast block/OHC 8V aluminum head just like the redblock. I didn't think you jumped to conclusions so readily. Last edited by lookforjoe; 06-14-2018 at 10:31 AM..
Chaps, question about the ring gaps. 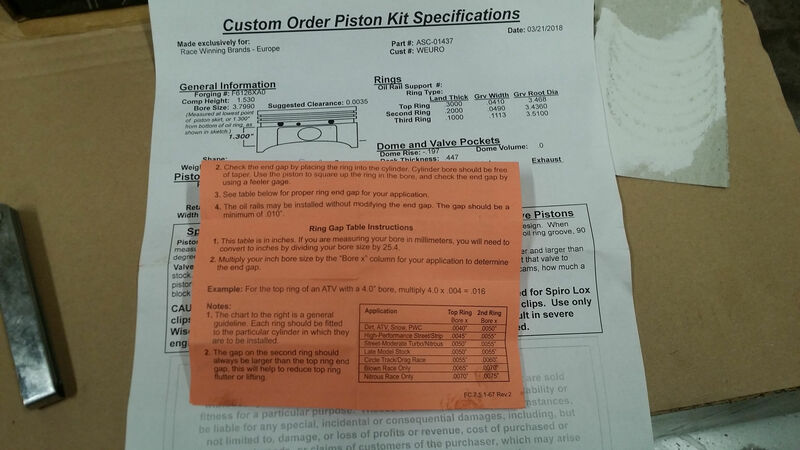 Looking at the little sheet that came with the piston kit: here. I think I fall under the "Street moderate Turbo/Nitrous" category. Does that sound about correct? I'm seeing numbers much higher scattered around the forum. Don't set it up with too little gap! I've seen what that does! 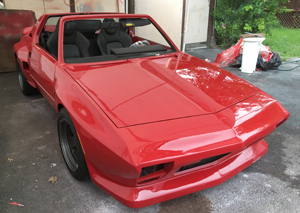 "It lacks power when under load; stalls and won't turn until it has cooled off." That one earned the name "Miracle rebuild." It got sleeved after the new rings oversized the cylinders. Doh! Follow instructions to the letter + .001" cuz yer a savage. I will set it up 1 or 2 categories higher.